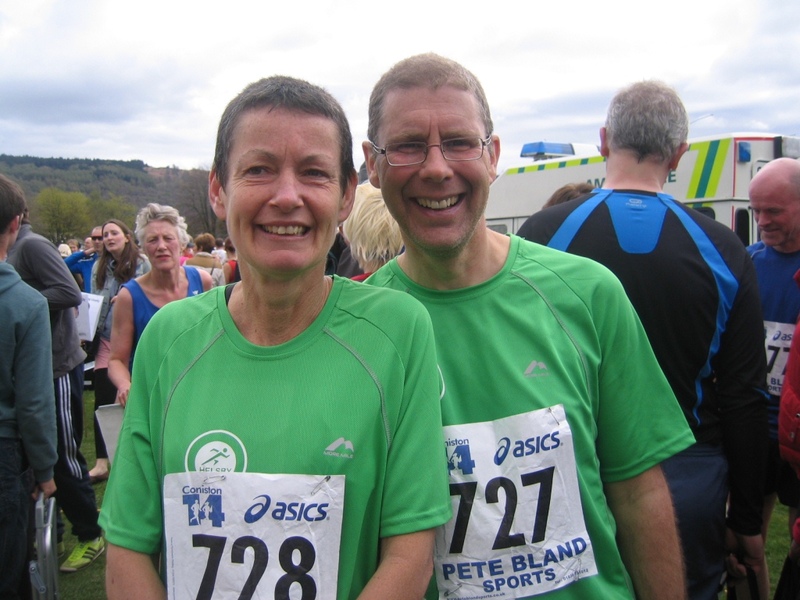 I took the opportunity to squeeze in the second fell race of my career while camping over the bank holiday weekend. After the Edale Skyline, my friend from the Lakes kept on referring to the concept of a ‘proper Cumbrian fell race’, and this one certainly felt like it, with three 2500 footers to negotiate. The route starts from Coniston village, and heads straight up Wetherlam, then across to Swirl How, south to The Old Man and then back to the village. ‘Navigation’ was only really going to be an issue for the descent of The Old Man, for which I was under strict instructions not to use the ‘Tourist Path’ at the start, and point myself directly at the village in the distance. I’d decided my tactic beforehand was to not kill myself on the ascent of Wetherlam to ensure I could give the descents a good go, as I’d not really been able to descend properly in Edale as I’d worked too hard on the climbs. So I started near the back of the field and tried not to be tempted to pass people on the way up Wetherlam. The idea of getting a lot of the climbing out of the way in the first couple of miles sounds quite nice in theory, but in practice it was a long slog up to the top, with only a couple of short flatter bits. It took a bit of concentration to ensure my legs weren’t burning too much. It was one of those climbs where you kept seeing a brow, only to get to the top and see yet another one in the distance. Eventually though the sight of a yellow jacket wielding a clipboard meant the summit of Wetherlam was here and it would soon be time to find out if the plan had worked and I was able to descend properly or not. Over the top I went and the descent started, and it was happening, I was actually descending properly! Not just keeping a descent pace, but actually able to attack it and pass people. 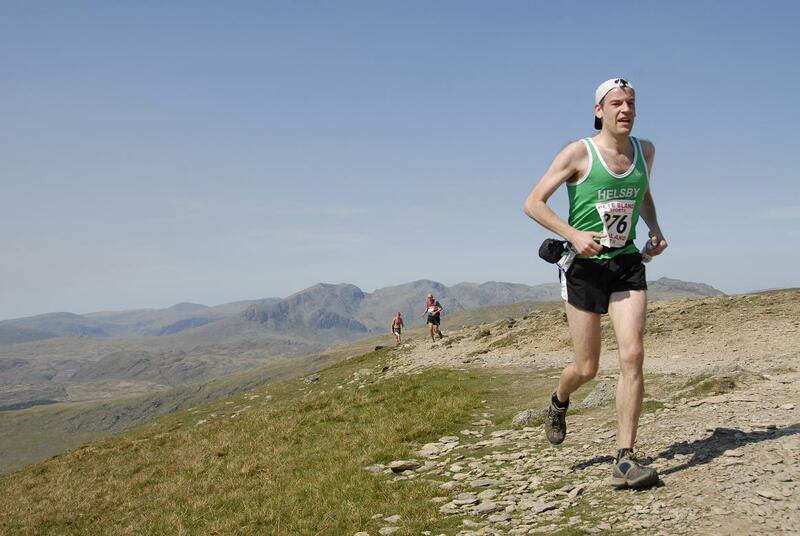 I was really enjoying myself at this stage and felt able to call myself a proper fell runner. Things slowed down quite dramatically on the climb to the top of Swirl How, and climb was the right word as there was a lot of clambering over rocks involved, and my legs were starting to give way after the efforts of the descent. This didn’t take long though, and I was soon rewarded with the most pleasant part of the race, being the run from the top of Swirl How to the top of Old Man. Both the down and the up part were very manageable at a good pace and the views were very nice, as can be seen from the photo. After the top of the Old Man came the most difficult part. I followed orders and launched myself straight off the top, but the dry bracken was very slippy and I had a moment stood at the top of one steep part unsure I’d be able to get down it, until someone else went before me and I had the confidence to follow. The descent was long into Coniston, and half way down we rejoined the main path. The hard surface was tough on the legs by that stage, especially when we passed the families playing in the stream which looked so tempting, but at it least suited me and I was able to get a few places back. At the end I was really happy with achieving my goal of being able to enjoy the descents, and indeed enjoyed the whole race and would recommend it, especially on a sunny day like it was. Time was 1’54”-ish, and about 190th out of about 310. Around the sixtieth percentile, so still room for much improvement, but a good deal learnt from the race so happy overall.